Let’s look at a couple of useful tools for predicting fast-growing, lucrative PPC opportunities: Google Insights For Search, and Google Hot Trends. 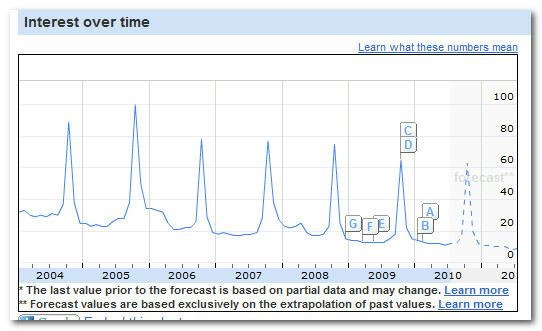 Google Insights For Search is a tool that shows you the approximate volume of searches over time. For example, here’s an Insight graph on the term “Halloween”. As you can see, interest in Halloween is flat for most of the year, except in October, when searches suddenly spike as the celebration draws near. You can use past historical data to plan your PPC campaigns to coincide with the time when most searcher activity is focused on your niche. Whilst Halloween is an extreme example, these trends can be used in a number of ways. One of the most lucrative ways to use Insight is to find quickly rising areas of interest. Like a bullish stockmarket graph that starts low and heads upward indicates a hot stock, the Insight graph for a hot keyword area is worth spotting early. Look at the graph for the iphone4, or the ipad. If you can spot fast rising niches before others, by looking for sudden spikes of activity, you stand to benefit from low cost advertising and huge traffic, at least for a while. How do you find such fast-rising graphs? Take a look at the bottom right hand corner of the Insight result page. You’ll see a section marked “rising searches”. This section is great for spotting very fast rising trends and breakout terms relating to the keyword term you searched on. Plug these terms into your keyword tools and look for similar associations. Also research trend watching sites, consumer news sites, and newsfeeds for fresh ideas. Another opportunity is to keep a note of news events relating to your keyword area. You can often spot these in the news headlines appended to the end of the graph. For example, the term “double dip” – a term relating to a another potential fall in the stockmarket – is a breakout term at the moment. 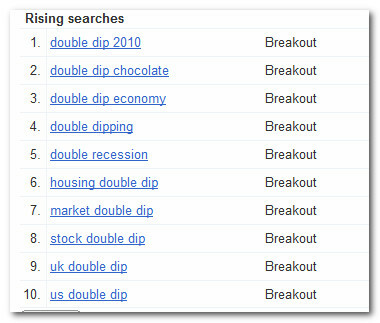 Terms closely related to “double dip” are also all in breakout. If you offered financial services – say stockmarket tutorials – you could advertise against such terms, and rake in the traffic. It’s unlikely you’d stumble across such terms using conventional keyword research tools. You can also segment by country and region. If you spend a lot of time marketing in one country, you may not be aware that terminology can differ in other countries. 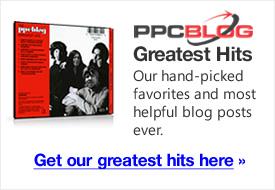 This tool is very useful for adapting PPC campaigns to different markets. Conversely, you can also look at declining searches. If you’re noticing declining performance in some of your campaigns, it might have nothing to do with you. The topic as a whole might show declining interest. The question then becomes: where is that interest moving to! 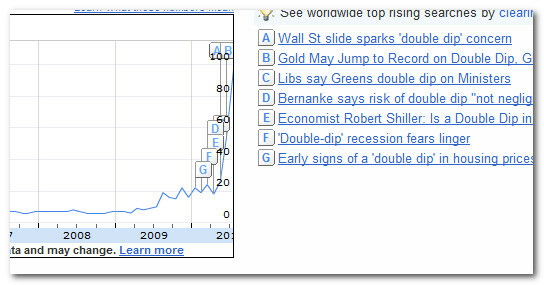 Google Hot Trends is another tool to help you find rising trends, and compare one trend against another. For example, say you promoted a celebrity site, and wanted to know which celebrities to focus your marketing around. 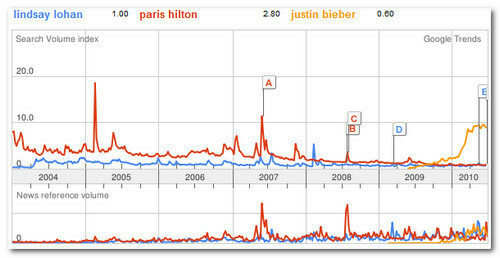 Here’s a chart plotting the relative interest in Lindsay Lohan, Paris Hilton, and Justin Bieber. You can also look for fast trending websites. This is especially useful if you’re using the content network. By targeting fast growing sites, you gain further opportunity to put yourself in front of your audience. Again, this data might be hard to spot otherwise. Hot Topics can be used as starting points for keyword research. 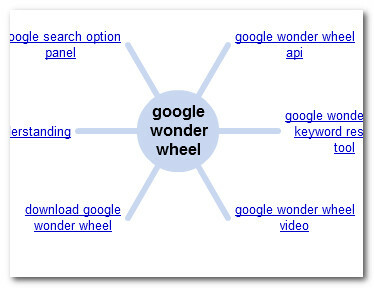 Plug the Hot Topics lists into the Google Wonder Wheel to get some out-of-the-box results in terms of topic associations. 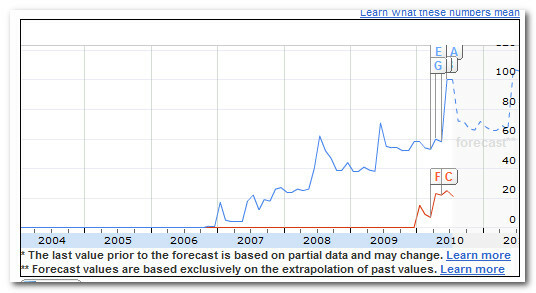 Hot Searches plots the latest hot search keywords. It’s a shame Google doesn’t offer more depth in the hot search categories. Given they only provide 20 for each day, you end up with a lot of US centric celebrity results. Say you are not selling what is hot, how is any of this relevant to you? Well, if your offer is broad enough (in terms of potential audience) then relevancy (and to some degree, endorsement) can be borrowed from popular people and trending topics in the news. Get Acai – as recommended by Oprah. Find a celebrity who endorses your product and include that in the sales copy. Maybe even create the product / service / website by building it around a co-branded strategy. Demand Media has done this with Lance Armstrong and Tyra Banks. Offer a free download or white paper. Be the first to review new products in your market & get some of your new products into the hands of well networked people who have loved them in the past. If you own a trusted brand and give away some iPads then you should be able to come up with some promotional angle where you break even or make money on the exposure. Such strategies can be used for list building, link building, gaining awareness for a new website/product/service, etc. And you can do niche offers in niche markets. A lot of trends can be seen in advance every year. Next year there will be another Halloween. Is there a way you can incorporate it into your marketing strategy? Other trends also lift up every year seasonally. Looking at past performance gives you a good idea of when it will become popular next year. Great points you share in here – thanks Giovanna. I have seen in one specific vertical, that the trends for the main keywords are actually falling as the long-tail becomes more diverse. In the last 2 years, many more players and much more information has come to be in this niche, so where older searches were all kind of lumped and pushed into the bigger buckets, now, the main keywords are falling in volume as the queries become more specific. At least that is how it looks. Based on the fact a click for the main keywords here rose from about $2 to $10-13 in that same timeframe, I’d say Google saw the value, jacked the rates, and spread out the power. Great post! These are both great tools. I find them helpful in crafting the right bidding strategy. In high volume times of the year, it often makes sense to bid higher to capitalize on the volume, take a lower % margin, but a higher $ margin due to scale (that is, assuming conv rate is flat, but it actually often goes up with the higher volume too). In other situations, it sometimes makes sense to bid higher in the off season and lower in the on season if continuity/predictability of revenue is very important to the organization. 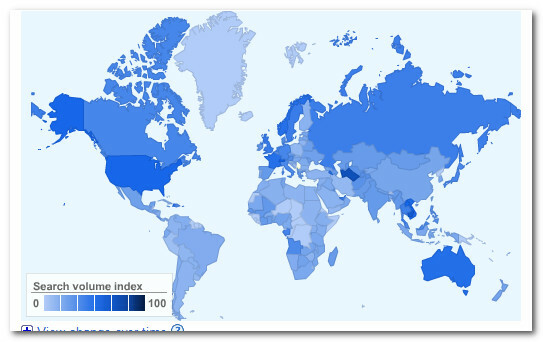 do you know if it is possible to hook into the google trends api and do mass extraction of all the “BREAKOUT” keywords by subject/country etc’ ? this would be a great way to systematically find new niches. if you know any tool that is currently available on the market i would appreciate if you could share this with us. Awesome post. I can’t stress enough about the importance of trends. Picking up on them before they explode can drive huge profits.